We are getting very close to finishing up our Me Books. I just wrote the newsletter for April--we have 10 classes left until the end of the year. Yes, 10! Can you believe it? I'm trying not to get to frantic and take one day at a time. 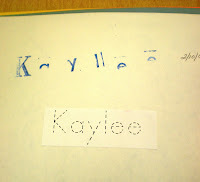 I first have the children stamp their names and date it. 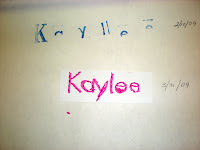 Underneath of that I have the children trace dots to write their names and date it. 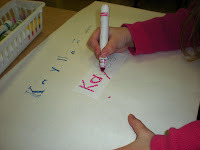 The final name will come in May, I let the children write their names by themselves then date that. 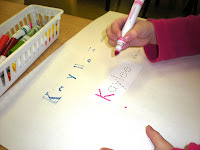 Now, some of them can do it and some can't, but I encourage all of them just to write any letters they know. I'll let you know how they turn out.